One of my favorite places to shop for green beauty products is The Organic Bunny. Not only does Amanda, the owner, do a fantastic job vetting products, but she even has an esthetician on staff whom we can email for a custom skincare and makeup routine. 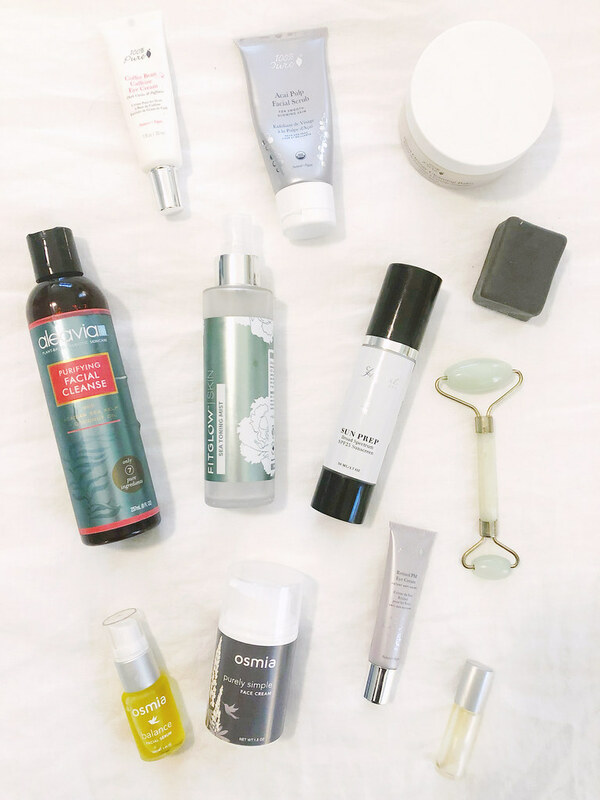 Up until July, I’d been using mostly 100% Pure products, but I wanted to step up my game a little more and see what a green esthetician would recommend for my skin specifically. I sent her an email along with a few photos of my skin at its worst (the morning after a night of swimming/hot tubbing and not washing my face 🙈). She gave me a great new routine that I’ve been using for a few months, mostly consisting of products from the brand Osmia Organics. Truth be told, I probably wouldn’t have picked these products out on my own, so it’s nice to have a professional guiding me in the right direction. Here’s a look at my new routine! I pat my face dry and tone with the Fitglow Beauty Sea Toning Mist. I’ll either spray on a cotton pad or spray directly to my face. When my face is about 90% dry from the toner, I’ll put on the Osmia Organics Balance Facial Serum. This stuff makes my skin SO happy and balanced! Every other day I use a jade roller to work the product in and help decrease puffiness and detoxify my skin. If I’m wearing makeup, I’ll skip the eye cream because the under eye concealer I use gives me the benefits I need, and it will prevent my eye makeup from smudging; I’ll use my jade roller to combat any eye puffiness. If I’m not wearing makeup I’ll use the 100% Pure Coffee Bean Caffeine Eye Cream. I love this stuff and it smells SO good! Lastly, I’ll put on the Hynt Beauty Sunprep SPF25. It’s an SPF, moisturizer, and primer all-in-one. It’s also the only SPF moisturizer that doesn’t give me breakouts, so that’s a huge win in my book. And it too smells great! If I’m wearing makeup I’ll either use Kaia Naturals Face Cleansing Cloths (this is perfect for when I remove my makeup before working out) or the 100% Pure Blood Orange Cleansing Balm. I also like One Love Organics Vitamin B Enzyme Cleansing Oil. Next I’ll either use the Osmia Organics Black Clay Facial Soap to cleanse my face if I’m in the shower. Otherwise, I’ll repeat AM step 1. I try to exfoliate every other day, and when I do I use the 100% Pure Acai Pulp Facial Scrub. As for masks, I’m working through some of the samples I’ve accumulated, but I intend to splurge on the Kypris Deep Forest Clay Detoxifying Mask next. And finally for my moisturizer, I use the Osmia Organics Purely Simple Face Cream. If I have any breakouts that need some extra TLC I’ll treat them with Osmia Organics Spot Treatment. I also keep a bottle of that stuff in my purse to spot treat on-the-go! The healing has been slow, but it is happening. Diet has played a HUGE roll in my breakouts too. I’ve noticed by eliminating dairy, gluten, and sugar my breakouts are not what they used to be.